adidas Originals will be releasing a new hybrid series that combines retro and model styles for the fall/winter season. One of the models added in the lineup includes the adidas Rising Star R1, which combines elements from the Rising Star and NMD R1 silhouettes. Originally released in 1984, the Rising Star was highlighted with its interchangeable pads embedded in the midsole. Now, adidas gives the shoe a modern makeover with their new Rising Star R1 hybrid silhouette. It features an upper from the Rising Star sitting atop an NMD sole. This particular colorway features a Silver leather upper with Grey suede overlays on the toe. Red and Black ribbon Three Stripes on the sides, atop a White Boost midsole and Black rubber outsole completes the design. 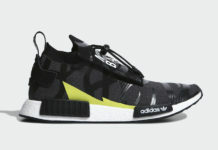 Look for the adidas Rising Star R1 to release later this fall season at select adidas Originals retailers and adidas.com. The retail price tag is set at $130 USD.